Should you Pik(min) this up? Nine years. That's how long it has been since a new Pikmin game has graced a Nintendo system. With the exception of two motion control-enhanced re-releases which proved how suited the franchise was to the Wii, a new entry in the series was conspicuously absent from the system's line-up. Nevertheless, Pikmin 3 is finally here — for Wii U no less — and hungry fans will be happy to know that this latest instalment has been well worth the wait. Taking advantage of all the unique features the Wii U has to offer and featuring some stunning visuals, Pikmin 3 is above all an enthralling and highly entertaining experience that all Wii U owners should try. For the first time in the series, Pikmin 3's story shifts the focus from Captain Olimar and instead follows the adventures of three intrepid explorers from the planet Koppai: Alph, Brittany and Charlie. Their home planet is in the midst of a food crisis, and it won't be long until everyone starves to death. In order to set things straight, the daring crew sets off on an interstellar journey to find new food sources and bring them back to a rather hungry Koppai. Unfortunately, things go a bit wrong, with the team crash-landing at their destination and getting separated; at this point, the mission becomes less about saving their home and more about saving themselves. Thankfully, the indigenous Pikmin are on-hand to help out when it comes to sourcing food and fending off some rather nasty critters. At its core Pikmin 3 is a game of survival and management, in which you must build up an army of Pikmin and use it for all your resource-gathering and combat needs. In the first Pikmin game on GameCube, the player had to finish the game within 30 in-game days or they'd fail, whereas the second game had no limits whatsoever. 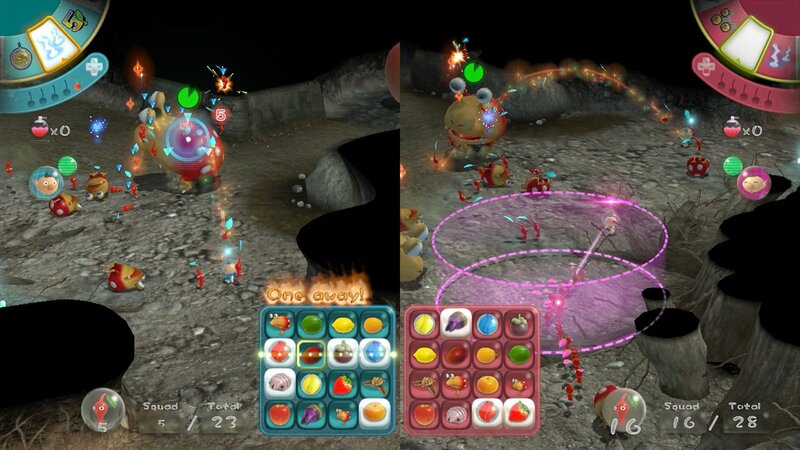 Pikmin 3's own system is something of a mixture of the two. In essence, you can take as much time as you like, so long as you have enough rations for your crew to survive; you acquire these through the collection of fruit, which you also need if you want to have any hope of saving Koppai. This gameplay mechanic strikes a good balance and if anything it focuses the experience; there's always enough time to take in the fantastic scenery, but dilly-dally around too much and Alph, Brittany and Charlie could end up going very hungry. 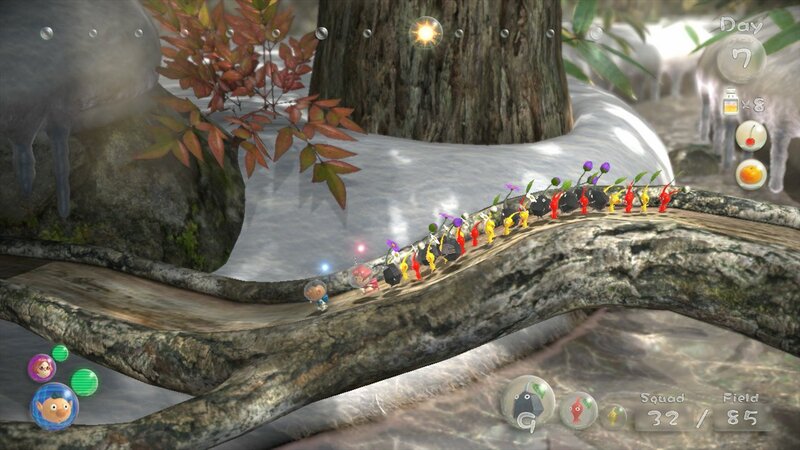 Pikmin 3’s narrative progresses at quite a considerable pace, but this is deliberately the case so that you're able to acquire every different type of Pikmin, some of which only appear in the later levels. This is important, because you’ll need certain variations for certain tasks, and it’s impossible to fully complete any of the levels without them all. This sort of gameplay structure lends itself well to Pikmin 3, as through different types of Pikmin you're able to open up previously inaccessible parts of a level and attempt newer challenges; it makes back-tracking a more entertaining experience and one which feels worthwhile. In order to make the most of your time, you'll need to get into the habit of multi-tasking. Perhaps in keeping with the number in its title, Pikmin 3's single-player mode allows you to control up to three leaders — and three different squads of Pikmin — at the same time. Controlling more than one main character is by no means a new addition to the series – the second game allowed you to control up to two characters — however, what's different this time around is that you have the Wii U GamePad at your disposal. The GamePad is put to good use, as the touch screen acts as a very useful secondary control method. The screen itself provides a map overview of the level, various other informational menus and a neat camera option where you can take pictures of the game environments from the viewpoint of your character and post them to Miiverse. Through the new "Go here" feature you can also send each of your characters and their Pikmin to different areas; even better, this can still be accessed when playing off-screen, too. You do have to be careful though, as Pikmin still have a tendency for getting stuck round corners every now and again. It's an issue that has been with the series since the very beginning, and it's frustrating that it's still present, but thankfully it doesn't happen too often. If all this multi-tasking sounds like it might give you a headache, don't worry, as Pikmin 3's story mode is well-structured and gradually eases you into the experience. Moreover, because you're not constantly racing against the clock, you can play at something of a relaxed pace. 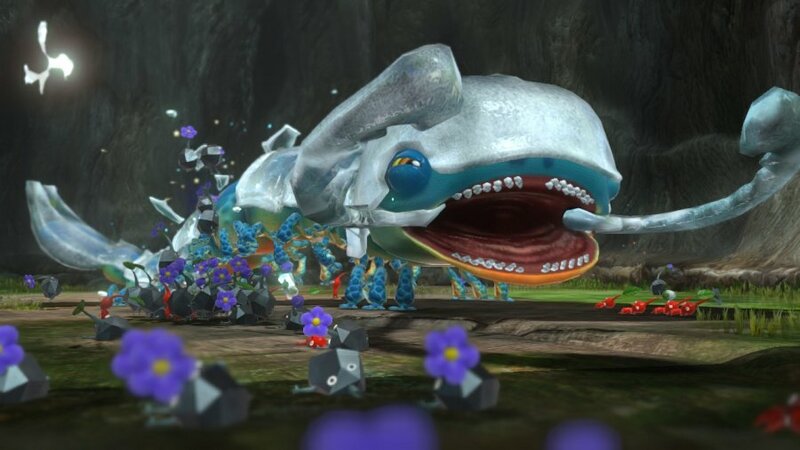 For example, when you first land in a new area, you might want to take your entire group out in case you run into trouble, or alternatively you may want to leave a character with a small detachment of Pikmin near your ship so you can still secure resources in the local area. Or maybe all you want to do is take a couple of in-game photos while the rest of your squad are hard at work. Whatever you choose, the GamePad enables you to approach the game in a number of ways that would simply be too cumbersome without it. With that said, there are other control methods aside from the GamePad, and players can choose to use a Wii U Pro Controller or the Wii Remote and Nunchuk combo. Should you choose to use one of these alternatives, you don't have to worry about losing the GamePad's touch-screen benefits as these are still fully supported; just prop it up on a stand and away you go. The Remote and Nunchuk setup is arguably the best choice, as the pointer controls allow for almost instant, precise control of your Pikmin; this is especially useful for airborne units which are tricky to pinpoint when using a stick to aim. The downside, however, is that you lose the freedom of camera control afforded by the second stick found on the GamePad and Pro Controller. Moreover, the GamePad and Remote configurations incorporate a motion-control element; a quick shake will disband your Pikmin and order them by type. This seems to be a little on the sensitive side, and can prove incredibly frustrating when you accidentally activate it in the midst of fleeing enemies and hazards. In addition to the iconic red, yellow and blue Pikmin types, meanwhile, there are two new variants to help you in your quest for food. Winged Pikmin change the mechanics of the game quite drastically, as they enable you to fly fruit back to your ship over chasms and water (although you’ll still need your trusty blue Pikmin if you want to fish out fruit from underneath the water) and can open certain types of gate. They’re also excellent at combating flying enemies, making them very much a worthwhile addition to the line-up. Otherwise, you’ve got Rock Pikmin, who are heavy little fellows that you need in order to break down glass walls and crystal formations. 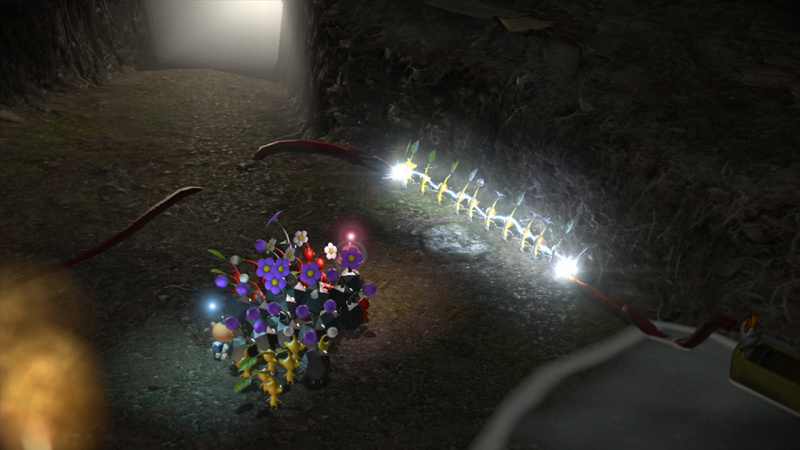 Much like the infamous purple Pikmin found in the second game, they also pack quite a wallop when used in combat. In case you’re wondering, White and Purple Pikmin are only found in the game’s multiplayer modes. 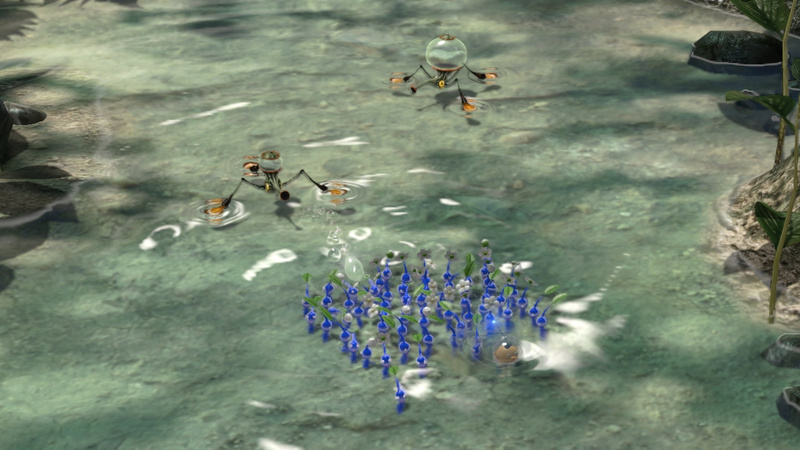 Having played through the story mode, it makes sense that they aren’t present: nearly every stage requires you to use a mixture of each Pikmin type to deal with hazards such as water, fire and electricity, and when you take into account that you’re then probably going to be dividing these Pikmin up into three separate squads, the need for additional and less useful types is reduced quite drastically. With that said, having the odd purple Pikmin around to single-handedly carry back a piece of fruit would have been very handy at times. Combat is certain a key component, and one which you have to approach with a strategic mindset, and aimlessly throwing your legions at any old enemy simply isn't going to cut it. Similar to the Pokémon series, you need to use the right type of Pikmin against a certain enemy; doing so can often mean the difference between losing your little creatures or saving them all. If you want to catch creatures off-guard, you can use a charge attack, which makes your Pikmin madly dash towards the enemy in a Charge of the Light Brigade fashion; again, the moment has to be right. There are a number of boss battles, too; while these are impressive in scale and present a solid challenge, it's fair to say that they're also incredibly long-winded at times. Something as simple as the bosses changing their attacks and attack patterns over the duration of a fight would make them feel a lot less tiresome. This small gripe aside, there's a wide range of different enemies to do battle with, all of which bring their own challenges to the table. Exploring the vast and diverse geographies, meanwhile, is made all the more exciting thanks to the beautiful visuals and evocative soundtrack. It's certainly not perfect, but for an early — albeit delayed — effort on Wii U, it’s definitely very easy on the senses. The scenery is impressively detailed, featuring an abundance of plant life and water that look remarkably realistic; all of this — combined with some high-quality lighting and weather effects — results in the best-looking Wii U title to date. The soundtrack provides a gentle, serene sound akin to Animal Crossing during the more relaxed exploration segments, but shoots up in tempo and grandeur when something big is going down. Despite this some of the textures appear to be a bit muddy and lacking in detail; this is especially true of the ground which mostly uses 2D, low-resolution grass textures. Otherwise, your sense of immersion suffers slightly from the lack of collision detection between your character and some of the in-game objects; for example, some of the vines and leaves don't rustle when you walk through them. 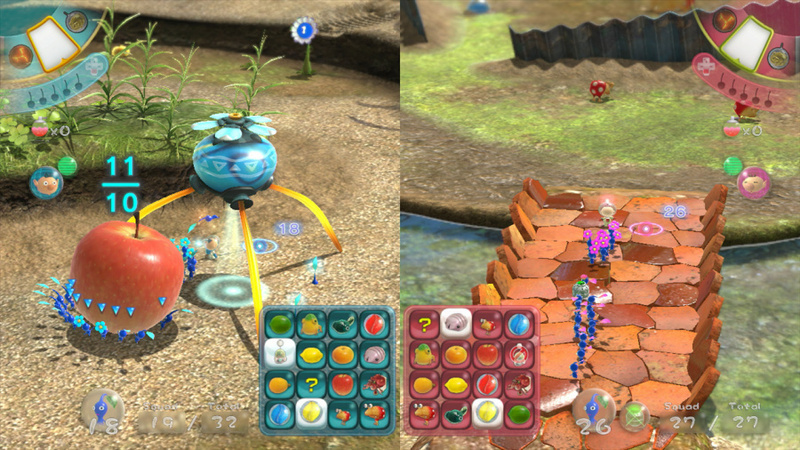 Pikmin 3 also offers two multiplayer modes: Mission (cooperative) and Bingo Battle (versus). The former is divided into three sub-categories, in which players can focus on a single objective, such as treasure-collecting, combat and boss battles. Each sub-mode, except for boss battles (which are taken directly from the single-player), is unique and separate from the campaign and provides a series of timed challenges. They’re surprisingly difficult, mainly as a result of the grueling time limits, and if you want to achieve the highest score possible you and your partner must work together flawlessly. For example, if cut off from one another with access to different types of Pikmin, it soon becomes apparent that if you don’t work with the aim of meeting up and combining forces, you’re simply not going to win. Although there are only a handful of levels for each sub-mode, there’s a great deal of replay value in each one, as part of the fun is working out the best approach to the level and frantically coordinating multiple groups of Pikmin. Given how well this mode works, you can’t help but wonder why the story mode can’t be enjoyed cooperatively; the multi-tasking elements are perfectly suited for play with another person, and this really does feel like a missed opportunity. Bingo Battle is a fun take on your traditional versus multiplayer mode. Each player has a bingo card of fruit and objects at the bottom of their half of the screen, and must successfully complete a full horizontal, vertical or diagonal line by collecting these things as you would normally. It’s kind of like Pikmin's take on Connect 4 in the sense that you are able to deviously halt your opponent’s progress by nabbing an item they need to complete a line. This strategic element makes it much more entertaining than a typical versus mode would, and there are a good number of different arenas in which to battle it out. With the single-player mode taking you anywhere between eight to sixteen hours to complete (depending on how much fruit you want to collect), as well as a reasonably fleshed-out multiplayer mode, Pikmin 3 should keep you entertained for a good while. In fact, once you’re familiar with the game’s mechanics and environments, there’s a good chance you’ll want to play through it again and top your previous effort. Beautifully crafted and filled to the brim with exciting gameplay features, Pikmin 3 is a worthy new instalment in Nintendo's quirky strategy series. The core gameplay mechanics remain true to the GameCube originals, but are further enhanced by the unique features of the Wii U GamePad; controlling your Pikmin is a much smoother experience as a result, and allows for a relatively advanced level of play. There are a few minor issues here and there, but overall Pikmin 3 proves Nintendo still has the magic to make games that get the most out of its bespoke hardware. Wowzers! Awesome review Can't wait to pik(min) this up! I guess I should "Pikmin" this up! Niiiiiice one, Martin! Getting it for sure now. Having tried it at the Gamestop event, this game definitely deserves the high praise. I need to get Pikmin 2 NPC first. Then I'll get this one. @MachineLaw You can delete them yourself easily. Anyway, I've been waiting a long time for this game. I didn't have a chance to go to the GameStop event, so I hope this game deserves the high reception it's getting! Will be downloading this when it come out on Friday!!!! Am I the only one who disregards reviews made before the game is even released? It's not like the reviewer has had the time to play through the game in order to have an educated opinion. Sorry if I'm wrong, TL;DR. I'll be picking this up on the 4th! Got it paid off and everything. Super excited. Totally Looking forward to this. One gripe - coop story mode would have been neat. I'm trying my hardest to remain excited and not let my disappointment about the length/lack of new features bring me down. Trying really, really hard. Been waiting for this for way too long. Downloading it the very second it hits the eShop. I do find that a lot of youtube reviews are based on first impressions and graphics and are pushed onto the web asap just to be the first ones. I should not put NL in the same boat! I'd get this game no matter the score. Miyamoto-san doesn't disappoint. Good review anyhow though Martin! COULD WE GET A DLC IN THIS GAME? @Fazermint No, you should not. They are not ignorant wanna-be YouTube "reviewers". This website is legitimate and they receive review copies directly from Nintendo. Awesome I hope Pikmin 3 will give the Wii U a little Pick me up, which the system truly needs. Is it Friday yet? Great review. i'll be picking up my copy on Thursday night... so exciting! I'm pretty desperate to pick this up but a bit low on cash at the moment and want to support The Wonderful 101 first! How does the time limit affect gameplay? When a day ends your current mission progress is saved as is or do you start over the next day? As in do you have to reopen gatez youve done so before? Or is the day cycle a nonissue in story mode? Great review. As good as downloaded looks like! Oh boohoo grammar nazi's galore. 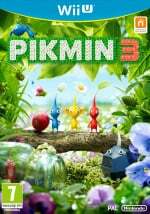 Great review, very well written and informative and very appreciative of the diversity in games which pikmin is a fine example of. Really, it's reviews like these that make me enjoy this site so very much. I was going to pick this up of course, but I hope others will do the same even if they have no experience with pikmin other than, perhaps, the otherwise not really representative nintendoland. So, local multiplayer only, right? Good question, @Erica_Hartmann - I'm curious of that as well. Pikmin 2 was pretty lengthy if you wanted to collect/complete everything. I played the demo at gs and was impressed with it. Visually it is beautiful and it feels really polished. @Fazermint They often have the game weeks ahead of time. How is that not amble time to formulate a review? the review ive waited for! I guess I have to get this now. Can we make it number 1 in the UK charts? For the past several years, I've been getting urges to replay the first two Pikmin games. But I kept thinking to myself, "No, I'll just wait for Pikmin 3. Surely it will come out later this year." I haven't played a Pikmin game in about 6 or 7 years. It's been way, way too long. It almost seems surreal that it's actually, finally here. Despite owning a Wii U since launch (and I'm rather fond of it) this is the first Wii U game that I'm legitimately excited about. I'm disappointed the best way to play this is via wii remote and nunchuck. The gamepad should have been used to better effect. Wonderful 101 for me. @nickysilks I agree that the control preference is disappointing, but I think the positives of this title far outweigh how it's best controlled and who says you won't prefer to use the gamepad? Great review, I want a Wii U.
Goodness, my body is ready!! Not my kind of game. Im sure others will enjoy it enough on behalf of others like myself. What are some of the minor issues? @Fazermint You are wrong. The reviewer gets a copy of the game before release and therefore is able to spend a good deal of time playing through the whole game before writing the review, sometimes up to 2 weeks. Prerelease reviews are not always the best, but this one seems well written and very good. Edit: Didn't see the above post mentioning he had the game for 2-3 weeks before release. I cannot wait to pik(min) this game up!! I hope there's a lot of content, this is the Wii U game I've been waiting for. I honestly skipped the review and just read the conclusion, I want as many surprises as possible! I wish it was out alright and hope the wait was worth it! so when your using the wii remote or pro controller is the gamepad still active and showing you the map? Could have been rated a 5 and i still would have picked this up . Quick question is multiplayer online or only local? To anyone who has played it, is this 60fps? or at least stable framerate consistently? @Emblem sorry for the lack of clarity - the multiplayer is local only. It really wouldn't work online without voice chat, as it requires a ton of coordination! And having two of you sat in the same room with the GamePad showing the screen is a really useful thing! @tchaten I fail to see the spelling error? Wow, great review. Was going to get this anyways since the wife loves Pikmin. Its still nice to see the amount of effort involved by Ninty in putting this title together before purchase. Pumped for this, loved the first never played the 2nd. Great review NL. btw.. There are quite a few other games that let you to use the gamepads touchscreen functions while using a pro controller or WiiMote. Ac3, and Darksiders are two titles I can immediately come to mind, but I know there are others. Stupid question time - how many save files? I need 3. Somewhat related - does the WiiU have user profiles like the PS3? Planning on picking one up w/ Pikmin 3 in 2 weeks and the part about posting photos to Miiverse made me wonder if we all get the same Miiverse account or my kids can have their own? Yup, it's running in 60fps, unlike 1 & 2 which were locked at 30. If I'm not mistaken the. Wii U will support up to 12 different user accounts with separate saves etc. You will be fine. I was already sold on this game, but this review sold me more on it... If that's possible. @th3r3ds0x - Thank you, that's good to know. Having my kid constantly bothering me to play my "app" games has me worrying more than ever about this stuff. I don't understand why app developers can't simply put in save slots w/ all the parents sharing their phones w/ their kids. I love Pikmin, but my heart breaks for every single Pikmin under my command that dies - and it shatters every time I have to rush out of a stage before my Pikmin can board the ship... watching them be surrounded and devoured by the creatures of the night. For that reason and that reason alone: I will not purchase Pikmin 3. Not because I don't like it - but I know fully well I won't be able to finish it with glee. Not again those blurred backgrounds! Now all Nintendo games will have those? I WANT'S IT!!!!! I CAN'T WAIT!!!! I have NEVER played Pikmin (except for the Nintendo Land attraction), but I am going to have to pick this one up, it seems. Let me rephrase so my question doesnt get ignored. The day cycle. During story mode does it affect the amount of time you can play? Like the first one where at the end of the day you had to continue the next day? I know there iz no 30 day limit in this game. Or is each mission considered 1 day? Even if it takes you 2 hours to complete it? EDIT: nvm another review answered my question. I wish this would come to 3ds (even though it's not going to). I didn't get a wii u. Now i'm actually starting to regret that. Noa offering 10$it eshop credit when you add funds for this or rayman. Um, that's quite ridiculous. You don't know how long @Martin Watts played the game. Furthermore, you don't have to finish the game to get a complete opinion, I quote the Great Philip Reed when I say(paraphrasing) "While at NintendoLife we do try to complete a game before we post our review, sometimes it's not necessary when we reviewers feel we have enough grasp on the game, we judge it by it's merits." Anyway, fantastic review, this rivals NLs Awakening review in pure greatness. @Fazermint Actually, they do. Reviewers are sent review copies ahead of release. Furthermore, the game is already released, in Japan for over a week now and it's releasing in Europe in just a couple of days. But yes, most reviewers have put many hours into this game, and some have even played it through to completion. On Nintendolife, reviews aren't posted until they actually have a copy to play through at will. @GN004Nadleeh You are selling your console because a 9/10 game is not completely how you expected? How stupid. Especially since you will absolutely regret that when other games come along. I can think of nine other games besides this one coming out before November 25 (the first year anniversary) that are worth a look to me. Who buys an entire console just for one game? Are you saying you have no other games for your Wii U at all up to this point, and thus no reason to keep it? I think you are being irrational and speaking nonsense. Wow this game is looking brilliant especially Bingo! That's why its selling so well in Japan. I once read an article in edge or games tm magazine about a guy who went to see some videogame composer in concert and the whole gig stopped for a 3 hour bingo break in the middle. Apparently that's quite normal. Finally, the Wii U gets the "killer app" it's been needing since day one. This would have been extremely helpful to selling systems if it were released several months ago, but better late than never, I suppose. Nice review. I still can't believe this game has finally arrived! Let's not make it another nine years, eh Nintendo? SOLD! cant wait for friday... Nice review as always! @Skotski I feel your pain. If I see a pikmin ghost, I feel terrible. Directly guilty even. But since I really enjoyed the games nonetheless, I'm picking it up day one! I've been waiting for so many years now... And what you buy or skip is entirely your call! Stinky about the Purple and White Pikmin but still it's a great score! @Kage_88 Kid Icarus had it worse. It had a 25 year gap. I was afraid that they won't put any time constraints on exploration (which made Pikmin 2 a little bit worse than the original to me, as I like when something pushes me forward in a game), but reading about the provisions eased my worries a little, though I imagine that it's very easy to simply stock up on food early on and be safe (wrong assumption?). My copy just dropped through the letter box, best I go to town and buy a wii u then! Glad it's reviewing well. Now the bigger thing will be if it actually sells well. We shall see. It is selling extremely well. Awww I am kind of ashamed that they took out White and Purple Pikmin and didn't add an actual "new" color but a big drawback(or should I say big relief) is the removal of caves which were notoriously difficult. I think these different styles of the trilogy should warrant a "Pikmin HD Combo" for $40 containing the first two games. Maybe they can even add a casual mode on the first Pikmin removing the 30 day time limit thus making this classic easier to actually beat. I admit I never finished either of the two games but hey I've waited 9 years for this and I ain't going to miss out on the Wii U's "real" launch title! I'm going to get this anyway, but has Mr. Watts actually played it or just the demo at a show? That would be important information in this (P)review...Please answer. @TheKachoMan See comment #12, apparently he's had it for about 3 weeks. I plan on buying the physical disc, this looks fun. @WaveBoy AWESOME.. thanks, I have been asking his question for weeks now, and I only get anti-nintendo haters from gaf (redundant i know) telling me its 30. I shouldn't be surprised, Nintendo usually aims for fast frame rates. comment 13: co-op story mode is something that should be included in more games. I always ask for it when I complete my club Nintendo surveys and I was really hoping it would be included here. Pikmin 3 seems like an especially good fit for co-op story mode. come on Nintendo! It can't be that much extra work to include it and I'm sure a lot of gamers would appreciate it! Still, this game looks awesome. @ted-k I always ask for it too! My son was bummed out and lost interest when I told him the story was only single player. =/ I'll still get it but would have been awesome to work together. I know where you're coming from. Pikmin has always seemed to have a dark undertone to me, using these poor little creatures for your own ends, even sacrificing some of them! still, it seems a bit extreme to not buy the game because of that. Although, I'm kind of the same about other games. I have no interest in Grand theft auto or most FP shooters because it just seems sick to me. Good review, even if it seems a bit nitpicky on some points. I'll be downloading this for sure! @ted-k To me, the Pikmin games are an amazing unique series. The polish and love given to them are undeniably great. And the love the fans have for the series is definitely earned. It's just great. But - if I can't enjoy it completely due to my fear and despair of losing one little Pikmin guy, then it's just a waste of a purchase. I'd just have it in my list of 'unfinished, probably never will finish' games. If this were a 3rd party game with an amazing and unique concept that needs to be supported: I'd definitely buy it, even at the risk of never finishing it (just to experience these kind of games is well worth it). But this is a Nintendo game, and it's the 3rd one in the series, it'll do well without my purchase - and if it didn't, then it successfully ends as a trilogy and nothing's truly lost (unless it hints at another sequel). ... But as it is, there ARE alternatives to this title. Little King's Story (Wii) was sort of Pikmin-esque and I feel far less guilt in losing someone in battle (especially when there's a high chance they'll end up revived), because I have a greater capability of preparing them for battle (as opposed to Pikmin, where no matter how much you prepare: your chances of losing a Pikmin are still ridiculously high). Then of course, there's the upcoming Wonderful 101, which is also almost Pikmin-esque. I'll be looking forward to playing it especially since I loved Clover Studios (now Platinum Games) - as well as enjoyed the Viewtiful Joe series. Those kind of games are affected greatly by day-1 purchases (Little King's Story didn't do so well, I believe... its sequel went to the Vita). Pikmin 3 will still sell at its full price years down the road, and it'll be purchased every holiday season, that's a safe bet to make. Welcome Pikmin 3, and many thanks to the li'l alien guys and gals from PNF-404 for watering the Wii U's garden, meaning that the Wii U retail game drought is finally over. Bring on boxed versions of New Super Luigi U (Fri.26 July 2013, UK), The Wonderful 101 (Fri.23 Aug 2013, UK), and Rayman Legends (Fri.30 Aug 2013, UK) next! I've ordered this now, so it'll be arriving at some time close to Friday 26th July, we're lucky in the UK to get a number of these Wii U games slightly earlier than the US. I'm going to juggle Pikmin 3 with Mario & Luigi: Dream Team Bros. and EarthBound over the next few weeks, which is unusual for me, because I'm a bit more of an arcadey, fast racer, speedy platformer, run-and-gun and beat-'em-up kind of gamer. After reading this review, I will focus on Pikmin 3's relaxed pacing through the story mode first. I'm sticking with Wii Remote pointer controls too, plus it's great to read high praise about the visuals here. I am definitely a fan of the game's depiction of natural environments and rural landscapes. A rockin' review, @MegaWatts. Rock-on, Rock Pikmin! The Conclusion sounds a bit..., "boring", haha. But as pretty much every other review confirms, this seems to be an amazing game and I'm looking forward to "pik" it up (well, that was good one) soon. That is, the day after tomorrow, presuming that Media Markt / Saturn in Germany will have it in their shelves from Thursday evening as it's usually the case. I understand that many were craving for new titles from Nintendo in recent months, but personally I very much appreciate that Nintendo is still valuing the quality of a game higher than purely economic interests. At the E3 last year, this merely seemed a good sequel, like Pikmin 2, but by now it seems a truly amazing game to me. I also appreciate that Nintendo seems to have focused on creating unique experiences throughout, rather than prolonging the play time as it was done in Pikmin 2, which, due to this fact, I never quite finished, it just got boring in comparison to the original. No worries! Leave it to the Big N for getting 90% of their games running in 60fps. I saw another review where the game had been "docked" for being over too soon. Does anyone know if this is about on par with how long Pikmin 2 was? 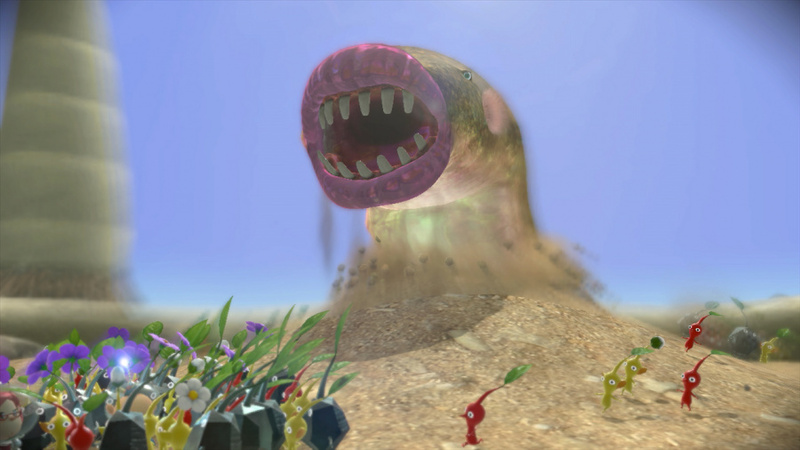 Pikmin 2 seemed decent in length when you took into consideration collecting all the items from caves and what not. Are we talking the same kind of depth here, or less? I saw that they may be talking DLC, but I don't want to take that into consideration just yet. Have not tried it yet, but it looks awesome! Am I right? I was actually just about to Pik(min) up my preorder for this game on Amazon. Nice review! I never got around to playing Pikmin 1 or 2, so I'm excited to play this game!! Looking forward to August 5/6, or whenever my copy arrives! This sounds really good, will actually be the first Pikmin game that I purchase. Have already preordered it, and will probably be able to get it on Friday. @WaveBoy Cred to nintendo! they seem to understand the importance of stable framerate. @globalisateur It works quite well in a game like this. Since Nintendo's Wii U games aren't 3DTV compatible (which I hope they will change when we get 3D TVs without using glasses) this is a good way to give the illusion of depth. @Blue_Yoshi At first i thought why need rock pikmin when you have purple ones. But they make much more sense. I think Miyamoto wishes he thought of them first instead or fat purple pikmin. Rock is heavy but also has sharp edges to break stuff. But he couldn't let them disappear in obscurity cause they have many fans, hence they are in multiplayer. I also think its wrong of people to dismiss this game by its cute and natural look. Cause damn this is a challenging game. Tougher than the Pikmin 1 I remember. Though glad the day-limit is gone. 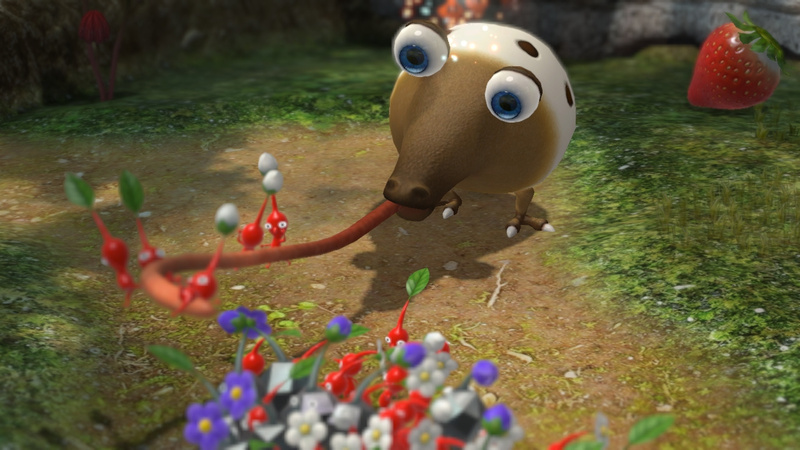 Also, its funny how we were all a bit disappointed at this years E3 but totally forgot about what impact a perfect Pikmin 3 would have on our gaming time a few months later. If this was the only Wii U game this year I still would've bought one. To think we are also getting Mario 3D World, (my favorite) Zelda TWW HD, Donkey Kong and Sonic Lost World just makes the kid in me as happy as can be. Who has time for Mario Kart and Co when we got those to enjoy. I am going to buy Pikmin 3 this Sunday!!! My dad got this for his birthday and I have watched him play it. From what I've seen of it, it looks absolutely amazing! The environments look very immersive (I love the water effects) and the gameplay is fun and creative. Have the game. Totally impressed. One problem though its a little short. I mean Bingo battle especially has serious replay value, but for a game in development that long? well, its just a little short, thats all. EDIT: Oh yeah, and, WERE DA @#%$in PURPLE AND WHTE PIKMIN NINTY??? My daughter, who is six, really enjoys the game. She mostly plays the missions rather than the story, though. We also have a great time using the multiplayer. I'm finally picking this up for my B-Day coming up. (Jan 24th). Couldn't get it when it came out because I was broker than broke. Between this and Wonderful 101, I think Pikmin 3 is the better choice. So much more surreal then super heroes. I almost feel bad having skipped over both games during the Game Cube / Wii era but third time's a charm. @StarDust4Ever Have you played Pikmin and/or Pikmin 2 now? The game is absolutely charming and beautiful. I've been playing it off and on, and I just reached the final location: Formidable oak. My only main complaint is that the days are timed way to short and don't leave you much time to explore. I found some of my fave moments were exploring the landscape, solving puzzles and finding fruits.. Outside of the main story. The timer limits that. I am so thankful for the demo. Didn't think I would enjoy Pikmin but I was horribly wrong.